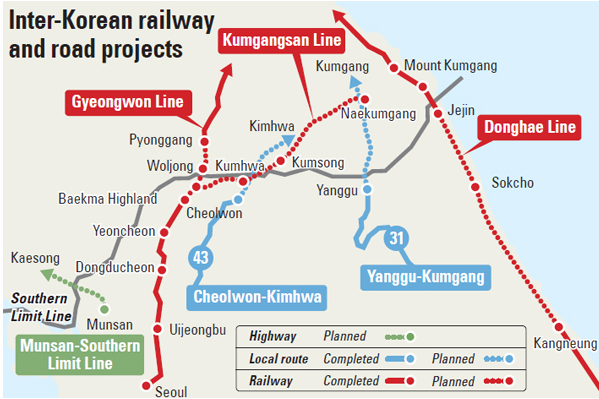 The news reported today in The Korea Joongang Daily under the headline "South pushes plan to reconnect rails and roads," made me think of the relative role of high speed rail and expressway links on the Korean peninsula versus linkages of fiber optic cable and other networks for digital communication. (click on graphic to see a full size version) As noted in the article, "The Ministry of Land, Infrastructure and Transport said Tuesday it will push forward a project this year to restore severed sections of inter-Korean railroads and highways. The project was announced as part of the ministry’s 2015 agenda. It is also part of the Park Geun-hye administration’s ambitious proposal to operate trains from Seoul to cities in the North this summer in celebration of the 70th anniversary of Korea’s liberation from Japan’s colonial rule - but only if Pyongyang goes along. Earlier this month, the Ministry of Unification unveiled a plan to restore the two Koreas’ western and eastern railways to operate trains this summer from Seoul to the North Korean cities of Rajin and Sinuiju. Unification Minister Ryoo Kihl-jae has said the goal is to link the railways and have trains operating in time for the Aug. 15 Liberation Day." The digital networks are arguably just as important in any plan for unification as the transportation networks, since the whole world seems to acknowledge their central role as infrastructure for the 21st century. Furthermore, North Korea lacks both modern transportation and communication infrastructure which means that the process of national unification will inevitably involve a costly, long term effort to build these. Consequently, one can envision a simultaneous effort to build both types of infrastructure, in which fiber optic cables are laid alongside railroad and expressway routes. Whether that becomes politically possible is an open question, but I would argue that in today's hyperconnected era the digital network connections are of equal or greater importance for Korean unification than the ground transportation links.